Had BLUE JAY been established at Gander Airport on September 18, 1946, Sabena OOCBG would not have crashed. 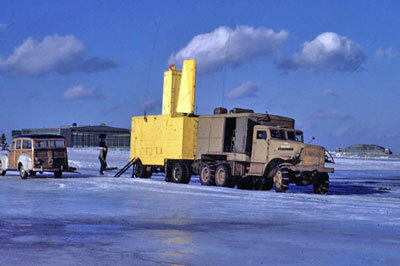 Blue Jay was a radar unit which directed aircraft to the ground at Gander Airport. It was the first civilian ground controlled approach (GCA) system to operate anywhere in the world. It was sent to Gander in 1946 and commissioned on December 9 of that year. It was supposed to operate for one thousand hours. Eleven years later it had completed more than eighty thousand hours and "talked down" thirty thousand aircraft. It was decommissioned in 1958 when the Federal Government installed its own unit. Blue Jay had the world's best safety record - perfect. 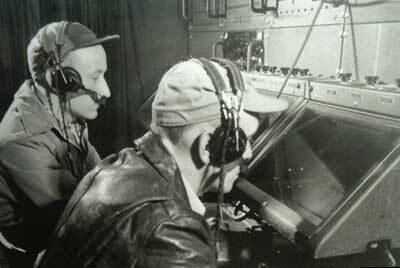 The aircraft were "talked down" by using a team of two GCA operators and three radar scopes. One scope had a radius of thirty miles, while the other two were short range (approximately eight miles) scopes which showed a pie shaped section of the approach end of the runway. 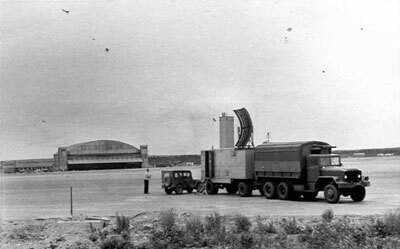 One of the short range radars scanned vertically from the ground up to approximately three thousand feet. The other scanned approximately twenty degrees of azimuth. One operator, using the 30-mile radar, directed the aircraft to the pie-shaped segment of airspace and then did the "talk-down" on the azimuth scope. The second operator tracked the elevation (glide path) on the other radar scope. 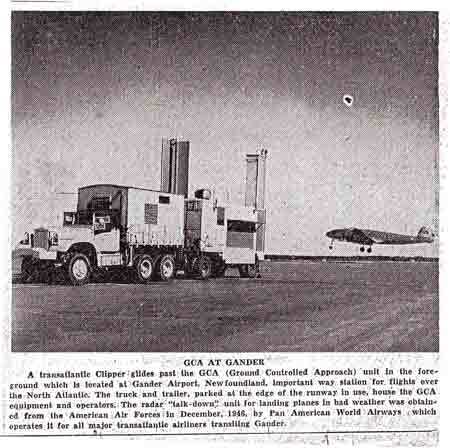 The operators provided GCA service for all of the Gander runways by moving the unit as dictated by the wind and weather conditions. The GCA unit was purchased from the U.S.A.F. and operated by Pan American Airlines who acted as "secretary treasurer" for a group of airlines (BOAC; TWA, KLM, ARAMCo. etc.) who shared the cost. Airlines that were not a part of this agreement (e.g., Trans Canada Airlines) payed for each approach on a user-fee basis. The charge was $125.00, however, if the aircraft was unable to land, there was no charge. The system was a U.S.A.F. WW II unit that had been used in the Pacific. The operators who were employed by Pan Am were the military chaps who had landed under fire in Iwo Jima with the Marines. The GCA operators were (to quote a 1957 journalist) "people who need fluent speech, a quick eye, and complete freedom from linguistic errors. He simply mustn't say 'right' when he means 'left' or 'zero one zero' when he means 'one zero one'"
A military transport plane became lost on a flight from the Azores to Harmon AFB (Stephenville). When the aircraft finally found Harmon the field was snowed in. The pilot circled the field waiting for the weather to clear. Fuel became critical and he requested an emergency landing at Buchans, but was informed that it would take an hour to light runway flares. He was unable to get a "fix" on Gander Radio Range, and after talking to Harmon tower requested information on the nearest way to the coast. His fuel was almost exhausted and he preferred to ditch in the ocean rather than crash in the forest. BLUEJAY was monitoring that particular radio frequency and could hear the aircraft's transmissions. BLUEJAY noted that the transmissions were getting stronger and suggested to the pilot that he continue on his present course in the hope that he would get within BLUEJAY's radar range. He had requested ditching information the second time when BLUEJAY picked him up heading in the wrong direction. They asked him to make an identification turn, then brought him in on a tight three mile bank to save fuel and put him on the glide path to the runway. The aircraft and the crew were saved. Each crew member knelt and kissed the ground when they got out of their aircraft on the ramp in Gander. "Obe" O'Brien was a particularly smooth talker and a super operator. He was bringing in an aircraft early one morning that had been flying approximately twelve hours and the crew was pretty darned tired. Maybe it was O'Brien's voice that caused them to relax too much because both pilots fell asleep at the controls. He kept telling them they were below the glide path but the aircraft didn't respond. Finally O'Brien took drastic action. He yelled in his headset: "Goddammit if you don't pull up you're going to crash!" That did the trick. The pilots responded immediately and after it was all over, the shaken pilots joined O'Brien for a thankful cup of coffee. O'Brien used to laugh about it, after, saying, "You know I could lose my licence for swearing 'over the air', I hope nobody reports me." Nobody did. George Breen Ed Findell, Per Midboe, Charles Nilson, Jim Ryan, Bill Stocks and Wayne Younger were replacement staff who joined later. 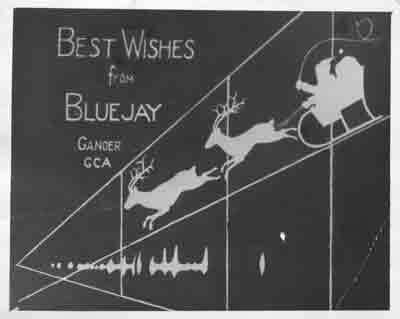 I joined Blue Jay as controller ( talking the planes down on it's final approach ) in Dec, 1946. I left Blue Jay to enroll in college in Sept 1950. Joe Green was my commanding officer in the Navy during WWII. We were attach to NATS and operated a GCA unit at Olathe, Kansas. We also had a perfect record-in all kinds of weather. Several of the Bluejay people ended up marrying local girls. John Jerome married Madeline Dunne (her sister Chris was an Immigration Nurse in Gander and married John Power with BOAC). John and Madeline lived in Kingston, NY but he died at an early age many years ago. Joe Green (head guy) married Pat Noseworthy from Grand Falls and then moved to his original home area near Green Bay, Wisconsin. Joe passed away quite a few years ago but I believe Pat still lives in Wisconsin. Russ Thomas married Daphne Noseworthy (Pat's sister) but later divorced. Believe Daphne is living in Costa Rica. Myron Danforth (Danny) married Elsie (don't remember her surname) - she worked as a waitress. George Breen married Gert Harvey, originally from St. John's. who worked as an Immigration Nurse at Gander. Understand they are still living in California.